Clovis Tub and Tile Porcelain Refinishing is a family owned business, servicing the Central Valley, including Fresno, Clovis and Madera. We provide outstanding service for commercial real-estate and residential homeowners. The company goal of Clovis Tub and Tile is to bring new life to old and worn out tile, counter tops, showers and other permanent fixtures in your home, apartment or business. The cost of purchasing new bathroom, kitchen sinks and tile work can be very costly. The tile and porcelain specialists at Clovis Tub and Tile are experts in saving you money when it comes to the “new or upgraded” look of more modern kitchen and bathroom finishes. Years of water running into your bathtub, shower, basin, sink, counters and tile can cause unsightly effects creating a porous surface which cannot be overcome with cleaners or scrubbing and buffing. Replacement is the answer that most homeowners lean toward, but refinishing can look just like new, and save you a lot of money! Clovis Tub and Tile Refinishing has developed a process for refinishing countertops, bath tubs and tile which is an affordable and cost effective alternative to replacement. All of our refinish work can easily be retouched in the future if our work becomes damaged. 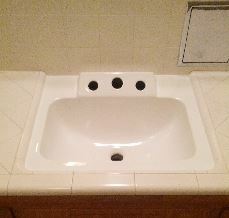 Many customers resurface their bathtubs sinks or showers to change the color. However the majority of our clients will resurface their bathtubs and tile because those items have lost their original luster over the years and have become hard to keep clean. Don't let unsightly porcelain and tile make your home look unsightly, out of date and unkempt. Before you buy new, Call Clovis Tub and Tile Refinishing for a free quote. You will be glad you did!